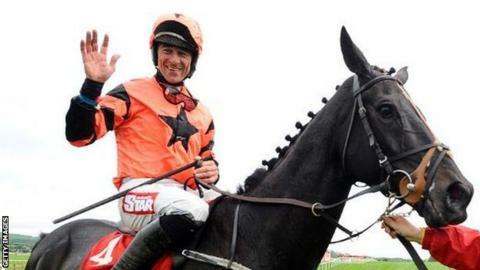 Jockeys Davy Russell and Philip Enright have had their bans for a whip-borrowing incident reduced from five days to two days after an appeal. At Clonmel on 4 December, Russell, 35, lost his whip in the Powerstown Handicap Hurdle and took Enright's whip towards the end of the race. The stewards found that both riders had breached Rule 272, which is related to bringing racing into disrepute. The pair are now free to ride at the Christmas festivals. Ireland's former champion jockey Russell was riding the Charles Byrnes-trained Leave At Dawn, while Enright was on Backinyourbox. Television coverage appeared to show Russell taking Enright's whip before the horses took the second fight. Both horses finished well down the field, with Leave At Dawn eighth and Backinyourbox in 12th. Both riders have clean records and the Turf Club panel took that into account when making their decision. Turf Club press officer Cliff Noone said: "The panel is keen to send out a message that these things should not happen. "However, both have clean records and the panel has decided their bans should be reduced from five to two days. "They will now be suspended on December 20 and 21."